Aero Express is an US Authorized Distributor for the Barfield DFQ40K Test Set. Aero Express will buy, sell and trade the DFQ40K depending on your needs. The DFQ40K is designed for and is compatible with all aircraft, which have AC capacitance, based Fuel Quantity Indicating Systems including those equipped with transient suppressors. 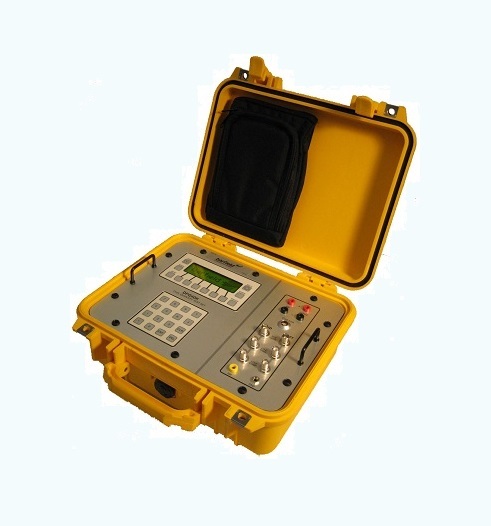 The DFQ40K has the ability to measure the insulation breakdown of tank units, wiring and connectors associated with the system, capacitance of the tank units which measure the level of fuel in the tanks and simulation of capacitances required to test and calibrate the aircraft indicating system. In addition to performing the standard capacitance tests of the Tank(s) and or Compensator, the DFQ40K has an additional troubleshooting mode that will provide the user with a relative indication of a problem associated with the Phase of the return current like that provided by the Barfield 2548H tester. The DFQ40K measures Low Resistances, DC Voltage & Indicator Drive Current. The DFQ40K is also equipped to measure the Distance To Fault to localize problems with the HIZ coax, continuity of the Shield Monitor, if the aircraft is so equipped, and Bonding tests to 0.001 Ohm resolution. Express Calibration is an Authorized ISO-17025 Calibration and Repair shop for the Barfield DFQ40K. Visit www.expresscal.com for full capabilities.